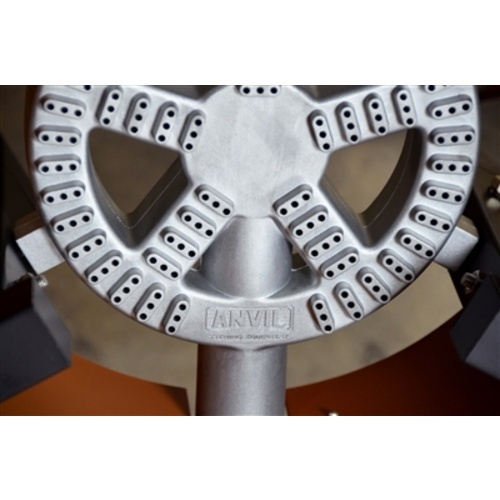 This Anvil Brewing burner is fast, quiet and efficient. 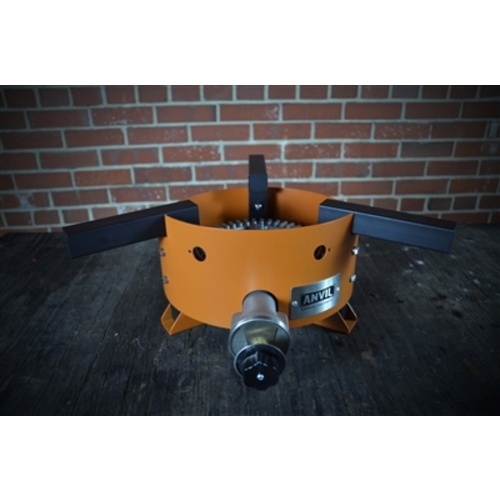 It comes with an adjustable height, a rust free aluminum burner, and many more features you'll love. Modular legs allow operational heights of 7", 16", and (with optional leg extensions) 24". Self-leveling feet give great stability. 72,000 BTU/Hr output for very fast heating. It can boil 5 gal in about 20 minutes! Heat is distributed evenly with the large surface area of the burner. A heat shield protects your valve and thermometer from heat damage. A deep burner ring lets you brew even in the windiest of conditions. Ultra-high temperature coating won't burn and melt like normal paint. Supports up to 20 gal kettles. This is my second Anvil Burner, first one is great. I'm new to brewing and i'm doing 1 gallon and some 2 gallon batches. Will this go low enough to do them on? My electric stove doesnt do to well during the boil. BEST ANSWER: I'm not 100% sure what you mean by "go low enough" but the burner is infinitely adjustable. I've used it for everything from a couple of gallons of water to blanch tomatoes through a 12 gallon wort boil and up to a 20 gallon pot of seafood. It's one of the best you can get for the price IMHO. I would recommend getting the leg extensions. I’ve been very happy with the two Anvil burners I use in a two pot system. I use the lowest setting to maintain a consistent mash temp. By using the lowest setting sparingly I can maintain consistent temps. I think the lowest setting would be fine for small batch brewing. I do no less than 5 gal batches. Even with that volume the lowest setting on the burner can still be a little overwhelming. I need to shut it completely off for steeping because even at the lowest setting it will rise well above 170. No, I think you would be better off using a turkey fryer burner or a less efficient propane burner, one that you can dial down infinitely. This burned will probably lead to an uncontrollable boil over. Yes, it goes quite low. Far lower than you’d want it to be for a good vigorous boil, even for a gallon or two. This will leave you with plenty of room to grow as well. I do 12 gallon batches on mine. Yes, it’s got good granular control. This is a great burner, and I’ve been very happy with it. Is this version 1 or 2? BEST ANSWER: Hello Adam - These are V1s while still in stock. We will likely carry V2 on the next shipment. Since More Beer description says 45,000 BTU’s. I would say version 1. V2 is 72,000. Will say my V1 has less BTU’s than my old Bayou, but it heats much faster due to the more even burn versus the one center flame in my Bayou. 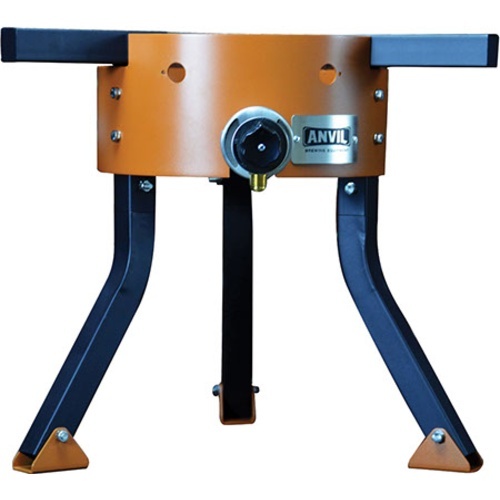 Can u hook up the anvil burner to a 100lb. Propane cylinder? BEST ANSWER: Hi Bernard - If you have the correct regulator, we believe that a 100lb cylinder would be compatible but also we would recommend calling Blichmann engineering (our supplier for this product) at 765-421-2018 to make sure. Assembly was quick and easy. On first usage, boiled maple sap for 13 hours. Adjustment to keep the boil at a good point without over-boiling was easy. I liked the burner with the standard size legs that come with it. Thinking the extensions would be too high for my large pot. Great burner! Heated 6 gallons to a boil in about 30 minutes. Orange paint burnt a little on first use but is only cosmetic, so no biggie! 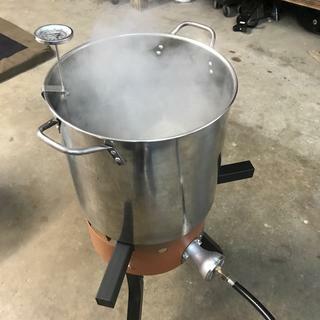 Upgraded to this burner from a walmart burner, SO much better for heat source, boiling wort faster and more consistent. No soot at bottom of keg. Much more stable base, I feel like I can stand on this burner no problem. 2 down sides, the beautiful orange paint has to burn off in some areas, kinda caustic smell. Also, on the venturi screen there was no air flow adjuster, the stock setting was OK, but could have been improved, so,I had to fab one to fine tune the air, gas mix. 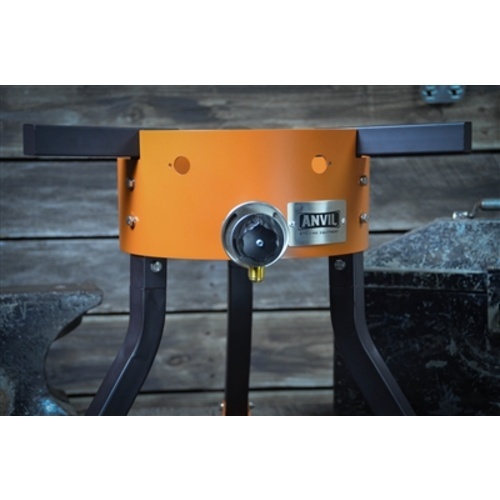 The Anvil burner puts out an incredible amount of heat and is very efficient. Very even heat distribution. 1) They need to improve their packaging. I've ordered three of these, and they all had the windshield scraped on the inside from the components moving around during shipping. This doesn't affect the function of the product, but is a little disappointing to see. 2) It's really a toss-up as to whether you'll get v1 or v2. My first burner contained a v1, but instructions for v2, which was very confusing. I contacted Anvil and they sent me a link to an installation video on YouTube. Their support is very friendly and responsive. 3) It's incredibly powerful and produces a nice consistent flame. It's ALMOST too powerful for a 5 gallon batch-size. I have to keep the flame almost at the lowest setting. 4) I haven't had many discoloration issues. The whole orange windscreen got a little darker, but it didn't bubble or burn black. 5) The leg extensions put your kettles at the perfect height to keep you from constantly bending over to check temperatures or connect hoses. The paint on mine has held up with only a minor browning to the color after a dozen brews. I have the leg extensions and it holds my 15 gallon kettle with 9 gallons of wort in it no problem. It heats quickly and the dial is easier to use than the one on my old Bayou burner. One I reach a boil I can turn the dial almost all the way down to maintain a boil. This burner works great but the instructions that come with it are awful. The parts list that came with it didn't match what I had at all. After some research I found out there are two different versions of this burner but the instructions are only for one. Even once I got that figured out I was still missing some of the flat washers I needed, but I made due. I have brewed one batch with it so far and I am very happy with the performance. Very satisfied with the first one I bought so buying a second was an easy decision. Great control, boils quickly. Holds my keggle steady; no fear of it falling over or off. Had tot add a wind shield using sheet metal to direct the heat, but overall works great.